Hey, y’all. I guarantee that my nearest and dearest are rolling their eyes and sighing over the title of this blog post. Yes, it just so happens to be my birthday, thankyouverymuchforremembering. I am a classic only child—I LOVE attention. I adore the anniversary of my birth. And, y’all, at my age, it sure as hell beats the alternative. Please know that I am using this auspicious occasion (42!) for the greater good, to handle a topic that you guys have been begging me to cover since the dawn of this blog: it’s vs. its. I am certain the problem arises because usually in the (extremely confusing and totally irregular) English language, you add an apostrophe + “s” to a word to show possession. * BUT, in this case, the one that shows possession does NOT have an apostrophe. That’s because it’s a pronoun and not a noun, y’all. “His” doesn’t have an apostrophe, now does it? And it shows possession. So there you have it. For anyone out there who is struggling with this topic, just remember this: IT IS HIS. Those three little words are the ones to use when you go for the TGB tried-and-true test-it method! Let’s give it a whirl, shall we? It’s my birthday! = IT IS my birthday! I know y’all are smart. And when we talk about these things, you get it. But then you get out there on Facebook and Instagram and start emailing and writing business letters and the next thing you know, you’ve typed “Let’s give this birthday it’s full attention” or “Today its Brandy’s birthday.” And that gives me the birthday blues. On this most special of days (for me), my sincere wish is that you slow down. Take your time. Pick the right word. And share the TGB substitution method with those folks out there who never seem to get it right . . . I know you know people like that. *You know, that’s when something belongs to someone. Happy birthday! Hope IT’S the best ever!! Thanks, Fransi! IT’S nice to have smart bloggers reading my work. I appreciate ya! *SNORT!! ** I can’t believe you still have that picture!! We’ll just have to have another Spice Tone event with another Cake Wreck-inspired confectionery treat, I suppose. And soon! 😉 Happy birthday, girl! Of course I have it. It was my favorite cake EVER! Ahhhhhhh. Finally!! A lesson I almost always get right. Happy birthday!! Hope you’re doing something awesome. Awesome . . . hmmmm. Just working for a living. One awesome part of my day is that I just read YOUR last blog post! Loved it. Also a pet peeve of mine, oh great GB!! Hope you have the happiest of birthdays!! By the way that is one funny cake, I did quite a bit of snorting myself just sitting here by myself in my office reading it! Peggy, you oughta check out CakeWrecks.com. Lots of snort-worthy stuff! Killer cake. I’m going to live underneat a bridge someday. 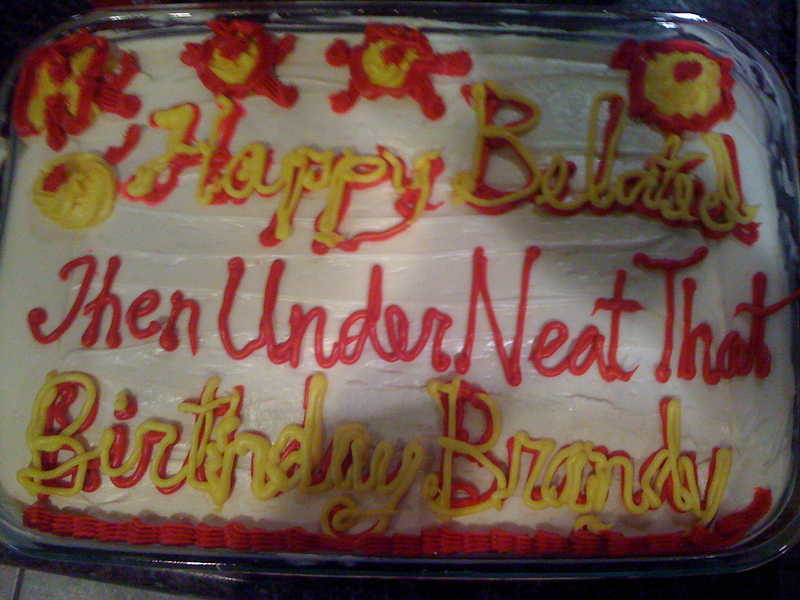 Happy belated then under neat that birthday! This entry was posted on November 9, 2012 by The Grammar Belle in Don't Make Me Beg, Punctuation, When Spellcheck Won't Help.